These revolutionary self-watering Strawberry ‘Growin-Pods’ will transform how you grow juicy strawberries ! An innovative, modular system that is incredibly flexible and has been designed so you can create any style of planting arrangement you need. Perfect for floor standing, vertical indoor and outdoor displays and for your convenience, colour co-ordinated watering trays are also available. Available in packs of 4 and 8 ‘Growin-Pods’, each pod measures 210 x 210 x 210mm. 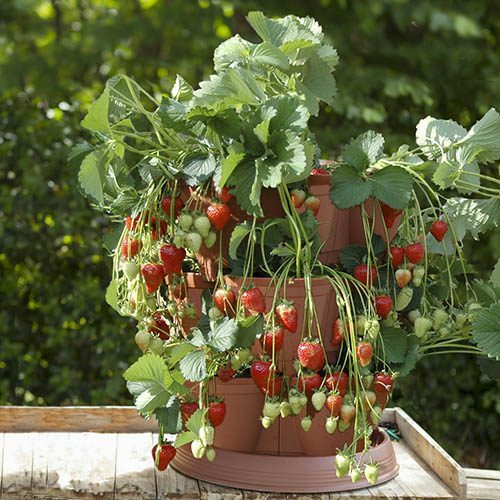 These revolutionary self-watering Strawberry ‘Growin-Pods’ will transform how you grow juicy strawberries and indeed virtually anything else on your patio this year and for many seasons to come! It is an innovative, modular system that is incredibly flexible and has been specifically designed so you can create the format, shape and style of planting arrangement you need. They will produce perfect results every time with the absolute minimum of effort and in stylish Spanish terracotta colour, they look great too. They are made from the highest quality high density polypropylene that is totally UV proof and they come with a complete and unconditional 5 year manufacturer’s guarantee! They are the last growing containers you will ever have to buy and can be configured to meet virtually any requirement you may have make use of corner spots, doubled up in to a ‘wall planter’ and even made in to a ‘wrap around’ planter for posts and corners! When configured in to layers of 4 pods, they create a 4-leafed ‘clover-shaped’ arrangement so you can create a solid, stackable tower that will add height and drama to any area of your garden.Each 5 litre capacity ‘Growin-Pod’ has its own integral water reservoir ensuring no water is wasted but also that your plants have a ready supply of water and plant food as they need it; they also come complete with specially designed steel wall brackets, so where you do create dramatic vertical displays you can do so with the complete confidence that they will be held completely securely. They are perfect for floor standing, vertical indoor and outdoor displays and for your convenience, colour co-ordinated watering trays are also available. Available in packs of 4 and 8 ‘Growin-Pods’, each pod measures 210 x 210 x 210mm. Each layer of 4 has a maximum width of 415mm and a maximum depth of 290mm. Designed by John Keats, the renowned Australian planter designer, these new and exclusive ‘Growin-Pods’ are not just attractive to look at but technically brilliant in terms of the growing environment they create for your plants. Made from incredibly durable and high density poly-propylene, they are completely UV stable so will not fade in bright light or go brittle in cold temperatures. They really are a planting system that will replace all others and will last for many years and each one carried a full unequivocal 5 year guarantee.They have been designed to be very easy to use but also incredibly flexible. They will create the most outstanding floor standing display and in clusters of 4 ‘Pods’ they securely interlock in to robust layers that may be build up to 4 high. When mounted on walls they will make the very best of your vertical spaces and look amazing in clusters of 5. A single ‘Pod’ will of course also fit neatly in to a corner and when three are connected you can create a visually stunning 270 degree ‘wrap around’ display that is perfect for posts and corners of buildings! In summary, they are a totally new and revolutionary planting system that supersedes all others they are simply perfect for growing strawberries and virtually any other flowering plant too. Supplied as the specified number of Grow In Pods, each pod with wall fixings, and strawberry runner. volume of each Pod about 5 litres. Can clip together and stack as singles, pairs, 3 round a pots or a complete layer of 4 Pods. Ultimate flexibility. Plant 1 Strawberry runner per pod, or 3 bedding plants if you choose a decorative look in future.